Ever wondered what else your pilot certificate is good for? Or perhaps you’re burned out on flying and wonder if there’s anything else you might be able to do in the aviation industry that doesn't involve flying. One of the things that becomes a challenge for people who choose a pilot career is the narrowly focused and highly technical skills that come with it. Flying requires a huge investment and there’s often no large reward. It’s a career that, in the early days at least, requires a significant financial sacrifice, and it comes with the stress of knowing that with just one small health problem, your flying career could come to a screeching halt. If you can’t continue to fly for one reason or another (if you develop one of these disqualifying medical conditions, for example), or if you just decide that you don’t like airline flying, you might be stuck. Many pilots have left the airlines and are successfully employed in other industries, but the limited scope of the pilot career means that if you aren’t flying, you may have a tough time finding another job. The risk of unemployment, furlough or health problems is the same for any highly technical employee, really, but for pilots specifically, there are not many non-flying alternatives to consider should an airline job not pan out. But all is not lost. Here are a few non-flying careers where you could utilize your skills as a pilot, quite possibly without ever getting into an airplane. Accident investigation fascinates most of us. But only a very small percentage of people in the aviation industry will work as an accident investigator, probably because aircraft accident investigators often have skills in at least two areas: a pilot who is also an engineer, for example, or maybe a pilot with a degree in human factors. Having experience in two different fields of study will help you get a job as an air safety in investigator for the NTSB, the FAA or an airline safety department. Being an airport manager is mostly about management, but you have to know a thing or two about airplanes, too, and most airline management positions require some experience in an aviation-related field along with a degree in management. A degree in aviation management along with pilot certificates will pretty much seal the deal if you’re looking for a job as an airport manager. The hottest job for pilots today might be unmanned aircraft system (UAS) operators, and because it’s a requirement for drone operators to have a remote pilot certificate or a current non-student pilot certificate, UAS operators who currently hold pilot certificates are in high demand. New companies producing and utilizing drones are looking for employees with commercial pilot certificates to operate their drones, either privately or in the commercial UAS sector. 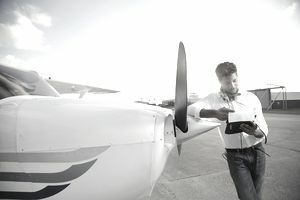 By having a private or commercial pilot certificate already, aviators who want to take advantage of these high-paying jobs will need only to take an FAA-provided UAS training course online. The Federal Aviation Administration in the U.S. employs safety inspectors who work in the field inspecting airports and operators for compliance and safety. While many of these hours are spent at a desk, many are also spent out in the field, at airports, and in airplanes. These inspectors give check rides and proficiency checks in a variety of aircraft, they inspect airways, airports and the airmen that use them. The FAA has competitive requirements for aviation safety inspectors, and they’re looking for experienced pilots to perform the duties of air safety inspector. Flight dispatchers are responsible for planning flights, calculating weight and balance, determining weather, and calculating fuel for flights conducted both inside of the U.S. and internationally. As you might imagine, having the knowledge of a private or commercial pilot can come in handy for flight dispatchers. Although it’s not a requirement to be hired for the job (an FAA dispatcher certificate is required), the pilot certificate and real-world flying experience will almost ensure that you’ll be a more competitive candidate for a job as a flight dispatcher than other applicants. If you're an experienced pilot with a lot of hours or years under your belt, and you're burned out on flying, have been unable to obtain a medical certificate or have been forced to retire, you are a perfect candidate for becoming an aviation professor. Teaching can be a rewarding career, and these days you can even do most of it online if you're looking for a work-from-home job to supplement your income. Everyone from your local universities and community colleges to the large flight schools like Embry-Riddle Aeronautical University or the University of North Dakota are hiring professors or assistant professors. And it's a flexible job- you can usually have some control over your schedule, work part time or full time and often get benefits, too. A degree is usually required, but it's really the experience in aviation that colleges are looking for when it comes to teaching aviation-related courses. What Will Your In-Flight Wi-Fi Cost? What is the The Sterile Cockpit Rule and Who Has to Use It? A Rundown of the Best Aviation Colleges in the U.S.